Gómez-Soberón, J.M. ; Cabrera, F.; Gómez, M. C.; Corral, R.; Gámez, D.; Guerrero Díaz, A.; Gómez, L.
Gómez, J. M. [et al.]. 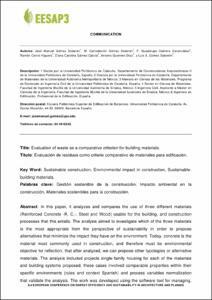 Evaluation of waste as a comparative criterion for building materials. A: European Conference on Energy Efficiency and Sustainability in Architecture and Planning. "III European Conference on Energy Efficiency and Sustainability in Architecture and Planning:". San Sebastián: Universidad del Pais Vasco, 2012, p. 73-80.